It’s a question most people ask every day: “Can I afford it?” A year or two ago, the answer might have been, “Of course I can! Put it on the card!” Now, not so much. Now, the answer requires a bit more thought. Envision Reality Software’s CanIAffordIt app for the iPhone and iPod touch is a timely and useful tool for these tight times. Cash Flow: CanIAffordIt uses your monthly income and recurring expenses to calculate whether a purchase is within your means. The app is essentially a simple expense tracker and calculator. It takes just a few minutes to set up. You need to input your monthly income and recurring expenses, such as your rent or mortgage, as well as savings and emergency funds (if any). You can add as many expense categories as you like. Once your data are in, CanIAffordIt will show you how much you have available to spend and whether you can, indeed, afford whatever the “it” in question happens to be. When you make a purchase, you can type in the dollar amount and a short description of what you bought for later reference. CanIAffordIt works well enough, but it is no substitute for judgment and self-restraint. If you have $400 in available cash today, then you can probably afford to make a $150 purchase—even if that purchase is stupid. 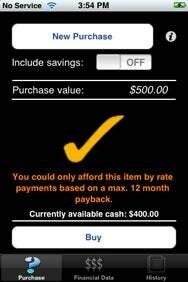 If you want to make a purchase larger than the cash you have on hand, the app will warn you that you could afford it only on credit. And isn’t that what got you in trouble in the first place? CanIAffordIt is compatible with any iPhone or iPod Touch running the iPhone 2.x software update.